An easy to make wrist corsage is gorgeous with little time and effort when you use products by Oasis. 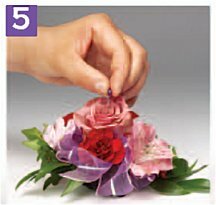 Using a cheap elastic wristlet and some tube floral adhesive, making corsages this way are fast to create and look beautiful when done. Professional florists are turning to flower glue and decorative materials to make unique, stylish wrist flowers and hold up well and can be created quickly. Do not mistakenly use hot or cool melt glue. They may hurt the flowers and break apart under cool, refrigerated conditions. Wristlets come in many different styles, from simple elastic to elaborate rhinestones or pearls. The newer designs have a flexible silicone tab attached to the bracelet and the flowers can be glued directly to the silicone square. If you are using a simple elastic bracelet, you can bend the prongs directly down over the greenery and begin gluing on top of this back. 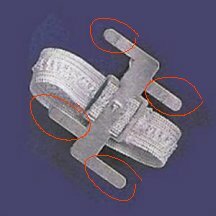 The tabs on these prongs bend easily and clamp down on the corsage flowers or bows for each attachment to the flowers. Florists usually use needle nose pliers to bend the prongs. 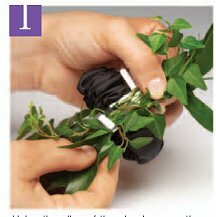 Begin by laying a few fresh or silk pieces of greenery over the tabs and bend them to clamp firmly on the leaves. 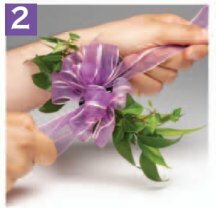 Make a corsage bow with several loops. Wired or stiff ribbon works holds loops better than fabric or unwired soft ribbon. After making the bow, lay it over the greenery and use the tails of the bow to gather under the wristlet, and then draw over the top, tying it firmly to the wristlet. The knot should be on the upper side, not underneath where is may be uncomforable for the wearer. Cut the heads of the flowers short. You can apply directly to the flowers or pour a bit of the floral adhesive out onto a disposable surface. Twirl the underside of the flower heads into the glue and let dry a few seconds before applying between the bow loops. Flower glue takes longer to dry, but holds fast despite water or refrigeration. Glue the flower in between the loops of the ribbon. Hold firmly for a few seconds for the glue to adhere to the ribbon. 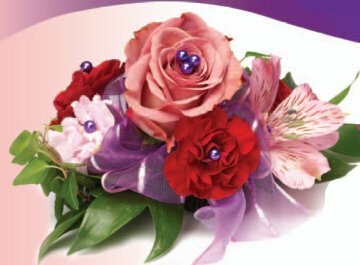 Continue adding flowers until you're satisfied with the look of your corsage. Add decorative elements, such as pearl headed pins, rhinestone pins, loops of decorative colored wire or other accents. 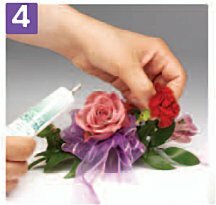 Mist your final corsage with a flower sealant such as Finishing Touch and lightly bag in plastic to hold in moisture. Re-mist often until wristlet is needed. Keep in refrigerator. Do not store near back or it may get too cold.